The United Kingdom is awash in legends and lore. Whether it’s tales surrounding ladies in lakes, swords in stones, or fairies, the Brits holds them dear to heart. And no place could hold them dearer than Cornwall with her buccas, piskies, giants, and mermaids. There isn’t a gully or mountain there that doesn’t have some legend attached to it. Perhaps that is why I am so fascinated by Cornwall. It’s a land redolent with atmosphere. In shorts, it’s the perfect setting for a book. And since A Dangerous Collaboration, the book featured in Whiskers on Kittens’ Springtime Giveaway, is set along the rocky coasts of Cornwall, I thought it would be rather fun to delve into some other books where readers get a taste of the landscape that shames the characters’ lives. 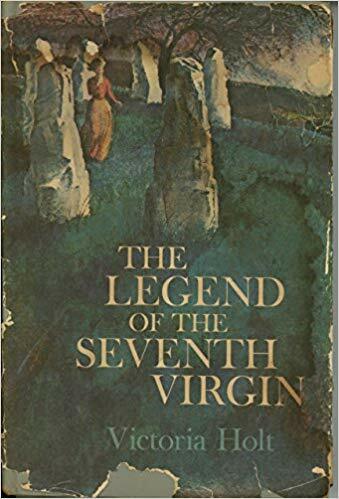 Hearkening to The Merry Maidens and The Pipers of St. Bunyan, The Legend of the Seventh Virgin by Victoria Holt begins with the tale of seven novitiates who are lured to break their vows one fateful night. 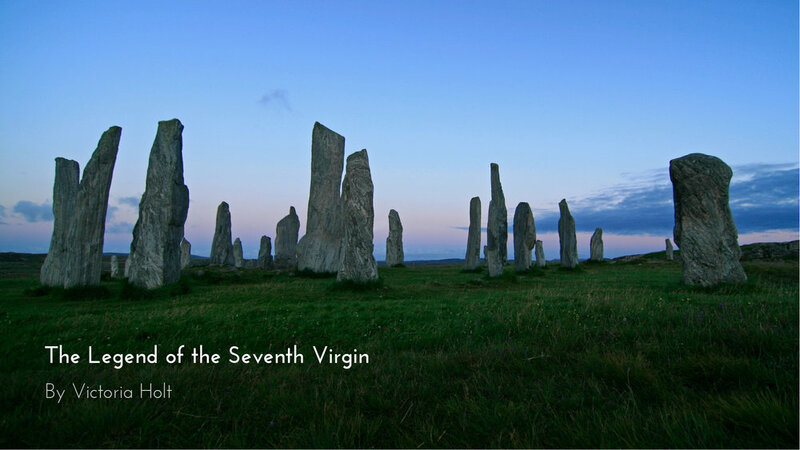 Six are turned to stone, but the seventh… the seventh virgin’s fate is all together different and indelibly linked to the convent she once called home. Years later, that convent is turned into a home: St. Larnston, where the St. Larnston family lives. But the history of what took place within its walls lingers, haunting the current inhabitants. That very lore draws Kerensa Carlee, whose obsession with St. Larnston dominates the narrative. While Kerensa is ambitious and driven, her character never matures to the point where I like her. But viewing the novel through wiser, more mature eyes, I appreciate the ending more. I’ll not tell you what that ending is, as that’s just dirty pool, but I will say that if you’re seeking a novel that thoroughly transports you to Cornwall, this is the one for you. This offering by Victoria Holt is somewhat different from her norm, but well worth the read. I assure you. The legends and life of Cornwall burst from the pages like waves crashing on her rocky shore. If you’re looking for a Victoria Holt novel that fits her customary mold, I can recommend Menfreya in the Morning. Like the Mistress of Mellyn and Bride of Pendorrice, Menfreya in the Morning centers around the Cornish castle Menfreya where the Menfrey family lives. The book is told in the first person through the eyes of Harriet Delvaney- an ordinary girl with attractive features that are nothing to write home about and a father who holds her in contempt because, in his eyes, she killed his wife in childbirth. Harriet’s lot in life is rather dismal. Her only joy is the friends she’s made at Menfreya- Bevil and Gwennan Menfrey. They are the ones that bring her comfort throughout her childhood, but if she’s honest, it’s really Menfreya itself that soothes her broken heart. Flash forward several years, and Harriet finds herself at her first London season, the outlier with her two favored cousins. But, she’s the one to snag a husband first, and it’s the man who she’s loved since she was a child: Bevil Menfrey. Vows are spoken and suddenly, Harriet is the mistress of Menfreya. But, as all good Gothic novels teach us, being mistress of a Cornish castle comes with haunting visitations and a heap of heartache. Did Harriet let her love of Menfreya cloud her judgment so much that she’s now made the mistake of a lifetime pledging her heart to a man who doesn’t’ love her? Will it be all’s well that ends well or will she be left holding the shattered pieces of her heart gazing out to sea from atop one of the machicolated tower? While Menfreya in the Morning is not as heavy on the folklore, it does give you a feel for Cornwall, and it has a castle. And castles, dear readers, are riddled with history- fictional or otherwise. Fairy tales are the threads from which this multigenerational tapestry is woven. Begun at the beginning of the last century, The Forgotten Garden chronicles three generations of women and how each one’s decisions impact the next generation’s lives. The twists and turns of this novel take the reader through a maze of mystery, and when we finally get to the center, we do indeed encounter our Minotaur. But while Theseus had to fight the mythical beast, the reader must contend with a stark tragedy hidden deep within the forgotten garden. This novel starts with a mysterious separation- a young girl aboard a ship in an unnamed Cornish harbor. Next we are in Australia when that little girl disembarks from the ship. No one is with her and no one claims her. The kind-hearted dock master takes her in. He and his wife call her Nell and raise her as their own. Nothing in her possessions hint at her origins. There is only an exquisitely bound volume of fairy tales. The tales are unique as are the beautifully rendered illustrations. This slim volume is the key to Nell’s story. Shifting between four time periods- 1900s, 1910s-30s, 1970s, 2000s- we watch the mysteries unfold around three women indelibly linked by the past. From Australia to Cornwall, we travel with Nell and then Cassandra, her granddaughter, to uncover the truth of Nell’s beginnings. But in the unearthing, tragedy and heartache are uncovered that only make both women feel their own sorrows more acutely. Morton does a great job leaving the reader guessing as to the fates of each woman. 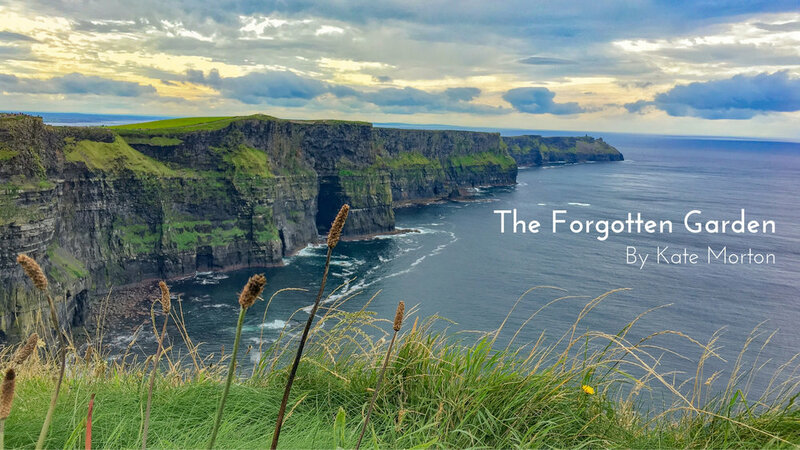 And while there is tragedy throughout the novel, the heart of The Forgotten Garden is one of hope. As the story blooms one flower at a time, thriving and growing the Cornish air, your child’s imagination will comes alive and you’ll find yourself wanting to revisit the fairy tales from your childhood to relive them once more. The Rose Garden is the story of one women told in two different time periods. I’m not ordinarily one for time-travel novels, but I will admit that there have been a few I’ve read and thoroughly enjoyed. The Rose Garden is one. Susanna Kearsley begins her book with Eva Ward returning to Trelowarth- a house in Cornwall where she spent many happy childhood time with her family. Her sister, Katrina, has now died, leaving Eva questioning her place in this modern world. She needs the balm of her past to sooth the ache of her present. But, something happens while she’s staying at Trelowarth- somehow she steps further into the past than she ever thought possible, all the way back to the 18th century. Similar to how Claire slips back and forth between times via ley lines in Diana Gabaldon’s Outlander, Eva becomes increasingly involved in 1715 with Jacobite smuggler Daniel Butler’s life. Shifting between her old present into her new past, Eva begins to rediscover herself in the wake of her sister’s loss, forging new friendships and finding herself within a new family. But, in which time does her true self live? Cornish history comes alive in this novel in more ways than one. True, there’s the exploration of the current landscape of Cornwall through Eva’s modern eyes. But my favorite part is when we get to see it through the Butler brothers’ eyes as they smuggle barrels of fine French brandy and other contraband into the coastal caves that pepper Cornish gullies. Owling was a common practice in Cornwall. It has the same allure as the buccaneer on the high seas for me. Instantly, Daniel and Jack Butler as well as their band of fellow smugglers made Eva’s trips into 1715 more exhilarating. This book is far more than a mere love story. Eva is searching for herself. Life has tossed her, and she’s lost herself somewhere. (Somewhere in Time… I simply couldn’t resist, dear readers.) Setting aside Rachmaninoff’s Rhapsody on a Theme of Paganini, The Rose Garden is an evocative, poignant, and enchanting novel. And since we’ve touched on the impossible, I think it only fitting to mention Anna Lee Huber’s This Side of Murder. In it, we meet Verity Kent, a WWI war widow who spent much of her lonely time during the war working at the war office were she decoded and did all manner of spy-ish things. Now that the war is over, she’s invited to a engagement party for one of her late husband’s friends on a remote island off the coast of Cornwall. The party’s a hodge podge of people who seem to get along terribly. At first Verity questions who drew up the guest list, but when she meets the bride-to-be, a perky Pollyanna type, she writes off her misgivings. That is until a mysterious message is left for her that shakes her newfound footing; someone is questioning the loyalty of her husband, insinuating that he was a double agent and traitor to the crown. Verity won’t stand for the besmirching of her beloved, and sets to work on cyphers to decode the messages and find the person leaving them for her. However, the more she unravels, the more perilous her circumstances become. And, because Cornwall can’t be left out, when events unfold that put her life in dire straits, the weather and landscape conspire against her. The novel is a quick, satisfying read alive with those Cornish storms that conjure almost paranormally and bring with them all manner of ill winds blowing no good. And amidst the brooding atmosphere, this novel is unexpectedly touching, particularly as it is a murder mystery. And because it’s impossible to write a blog post about books set in Cornwall without mentioning her, I must acknowledge Daphne du Maurier. Take your pick- Rebecca, Hungry Hill, Jamaica Inn, Frenchman’s Creek, take your pick. All her novels are set in Cornwall. Daphne du Maurier translated her homeland onto the page, indelibly tying the moody resonance of her novels to the Cornwall she loved and lived in the whole of her life.